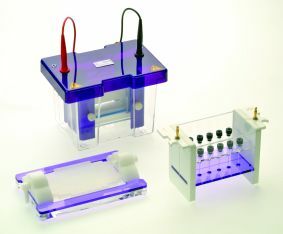 The OmniPAGE 2-D Systems include both modules required for Slab Gel and First Dimension Electrophoresis and accessories, to provide a complete Mini, Mini Wide or Maxi 2-D system. 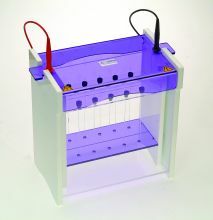 The Tube Gel Module includes a rapid release gasket for easy tube extraction. 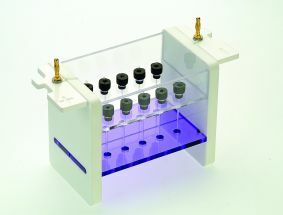 Focusing can be accomplished in as little as three hours in the Mini Unit. 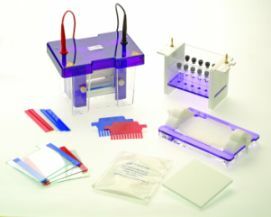 Disposable capillary tubes are included for added convenience, plus 2-D combs and spacers which are color coded according to thickness for easy identification. 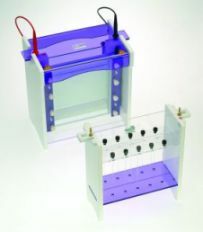 These stand-alone, complete units for first dimension capillary/tube gel electrophoresis, Mini 10x10cm, Mini Wide 20x10cm and Maxi 20x20cm formats, include omniPAGE tank and lid, tube gel insert, tubes and blanking ports. 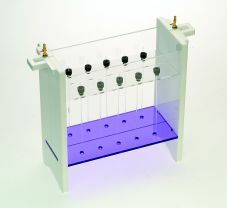 Units are interchangeable with omniPAGE slab gel and electroblotting inserts.